28 Days of Inspiration – Day 21: What’s for lunch? James discovers zero carbon farming – underground! Here at 6heads we love food and we love the pioneers blazing an innovative trail in making our food more sustainable. On our harvest hike last autumn, Kate from GrowUp talked about how they are making their vision of closed-loop, hydroponic, rooftop, urban farms a reality. Or our friends at Hodmedods, a recent start-up seeking to encourage people in the UK to fall back in love with the humble fava bean as a low carbon protein source that can be grown here, in contrast to most other beans which are imported. 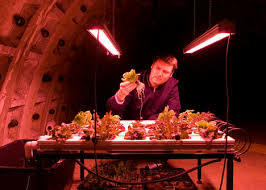 Perhaps most counter-intuitive is Zero Carbon Food’s current initiative to grow salad greens underground in an old London bomb shelter! As Stephen Drink points out it a Guardian article about the initiative: “Open field and greenhouse farmers are affected by low light, weather, pests, all of those issues”, says Dring. “Between 2009-2012 food inflation ran at about 32%. That’s because of issues with crop production and failed crops … down here we have no pests and a consistent temperature of 16C. Once we’ve put all the LED lights in they give off a little heat that will take us up to about 20C, perfect growing temperature.” The lights are currently powered by a renewable energy supplier, but they plan to generate their own renewable power on-site using wind and solar energy.